Travel: Each player must exhaust 1 hero he controls to travel here. 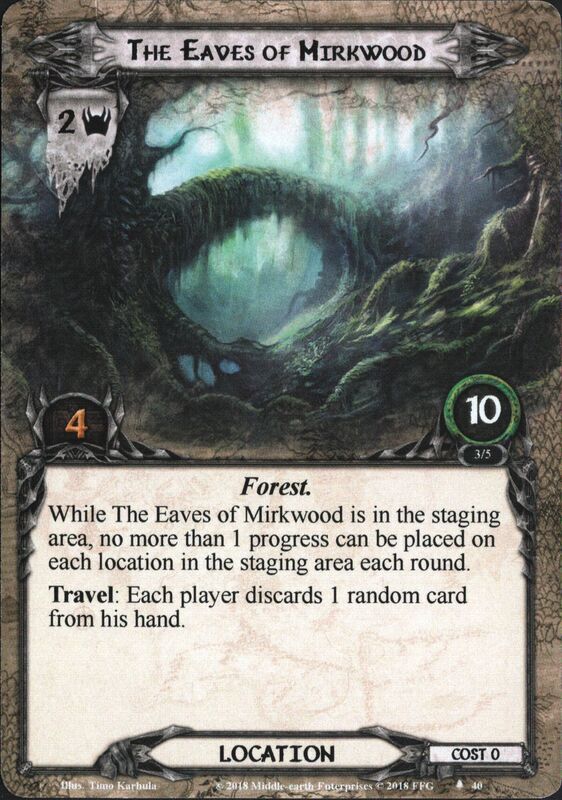 Travel: Reveal the top card of the encounter deck and add it to the staging area to travel here.Response: After Mountains of Mirkwood leaves play as an explored location, each player may search the top 5 cards of his deck for 1 card and add it to his hand. Shuffle the rest of the searched cards back into their owners' decks. While Enchanted Stream is the active location, players cannot draw cards. Response: After you travel to Old Forest Road, the first player may choose and ready 1 character he controls. Response: After you travel to Forest Gate, the first player may draw 2 cards. 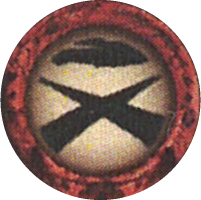 While Oak-wood Grove is the active location, resource tokens from any sphere may be spent as Leadership resource tokens. 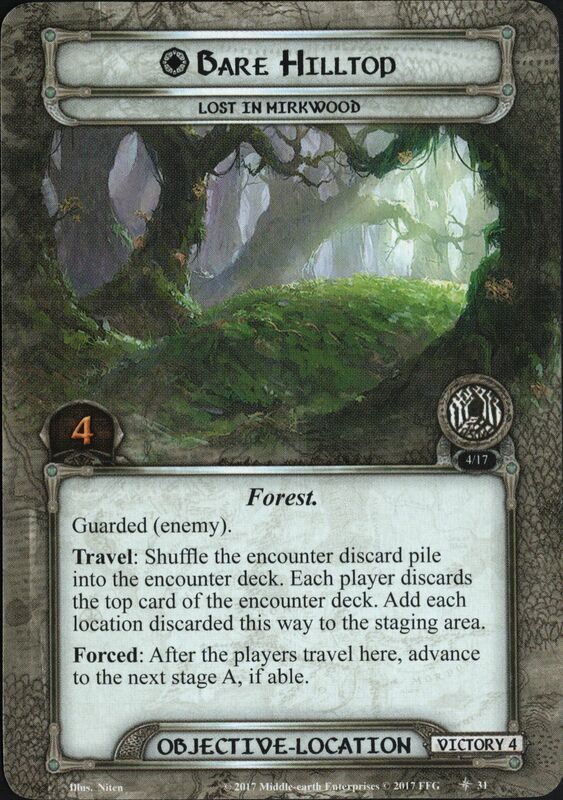 Response: After the players explore Forest Grove, search the encounter deck and discard pile for 1 Athelas objective, and add it to the staging area. Then, shuffle the encounter deck. X is the number of players in the game. While Rhosgobel is in the staging area, Wilyador cannot be healed. Travel: Players must complete stage one of this quest before they can travel to Rhosgobel. 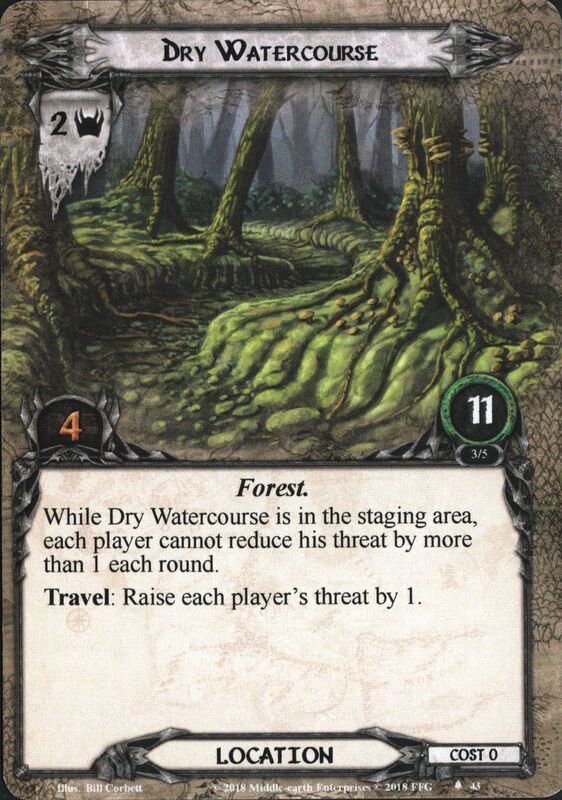 While Dry Watercourse is the active location, all treachery card effects that target the player guarding Gollum also target each other player. While The Spider's Ring is the active location, the player guarding Gollum cannot change. Shadow: If this attack is undefended, return any current active location to the staging area. The Spider's Ring becomes the active location. Response: After the players travel to Wood Elf Path, the player guarding Gollum may choose a new player to guard him. Travel: The player guarding Gollum must exhaust a hero he controls to travel to Woodman's Glade.Response: After exploring Woodman's Glade, reduce the threat of each player not guarding Gollum by 2. While Ithilien Road is the active location, the engagement cost of each enemy in the staging area is 0. Shadow: Return attacking enemy to the staging area after it attacks. Action: Exhaust a Ranger character to place 3 progress tokens on Overgrown Trail. Shadow: Remove X progress tokens from the current quest, where X is the attacking enemy's Threat. The cost to play each player card is increased by 1. Travel: Exhaust a hero to travel here. Heroes cannot gain resources from card effects. Travel: Each player must pay 1 resource to travel here. Each Wose enemy gains Archery 1. X is equal to the total archery value of the highest archery Wose enemy in play. X is the number of players in the game. 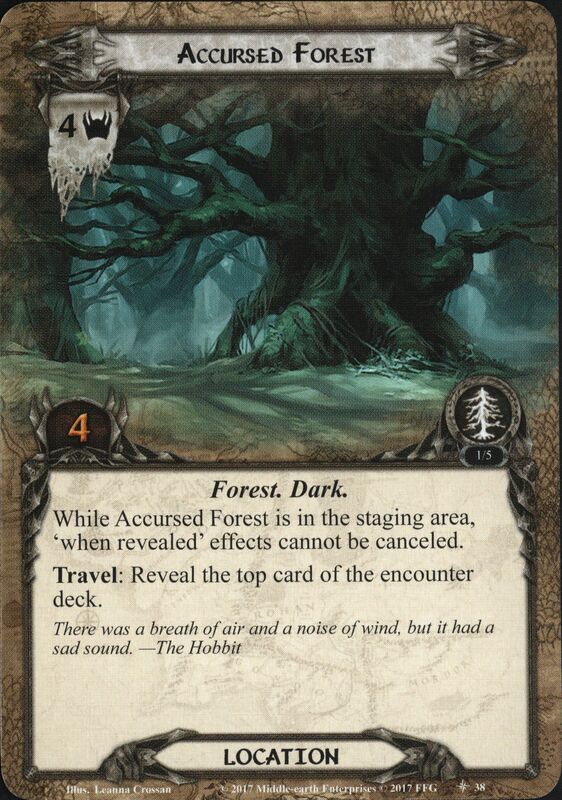 Forced: After The Dark Woods leaves play as an explored location, the first player discards 1 hidden card. Immune to player card effects. Travel: Search the encounter deck and discard pile for a Huorn enemy and add it to the staging area to travel here (2 Huorn enemies instead if there are 3 or more players in the game). While Heart of Fangorn is in the staging area, each player cannot refresh more than 5 characters during the refresh phase. Attacking enemy makes an additional attack after this one. While Ancient Forest is in the staging area, each Forest location in the staging area gets +1 Threat and +3 quest points. This ability does not stack with other copies of Ancient Forest. Shadow: Defending player exhausts a character he controls. While Tangled Woods is in the staging area, each Forest location in plays gains: "Travel: Exhaust a hero to travel here." This ability does not stack with other copies of Tangled Woods. Forced: When a Guardian enemy attacks, deal it 1 additional shadow card. Forced: After a Guardian enemy attacks, raise each player's threat by X, where X is that enemy's Threat. Immune to player card effects. X is the number of players in the game. Travel: The players must exhaust 3 Key objectives. Forced: After the players travel here, each engaged Guardian enemy makes an immediate attack. Travel: Search the encounter deck and discard pile for a Spirit enemy and add it to the staging area. Shadow: If this attack destroys a character, remove a time counter from an enemy, if able. Travel: One player chooses and engages an enemy in the staging area. Shadow: Defending player either exhausts a hero he controls, or returns attacking enemy to the staging area after this attack. Immune to player card effects. Response: After you travel to Patch of Woods, each player adds 1 resource to each of his heroes' resource pools. 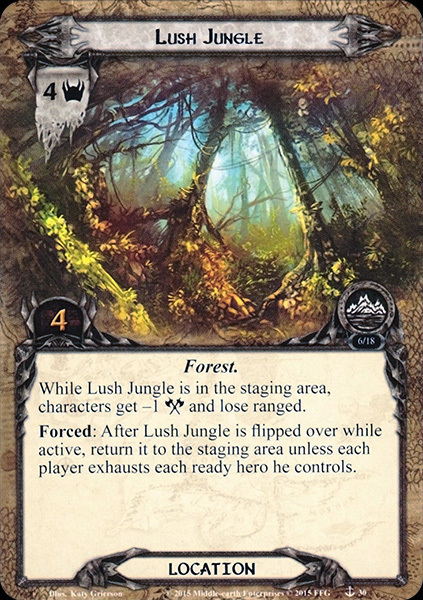 While Lush Jungle is in the staging area, characters get –1 Attack and lose ranged. 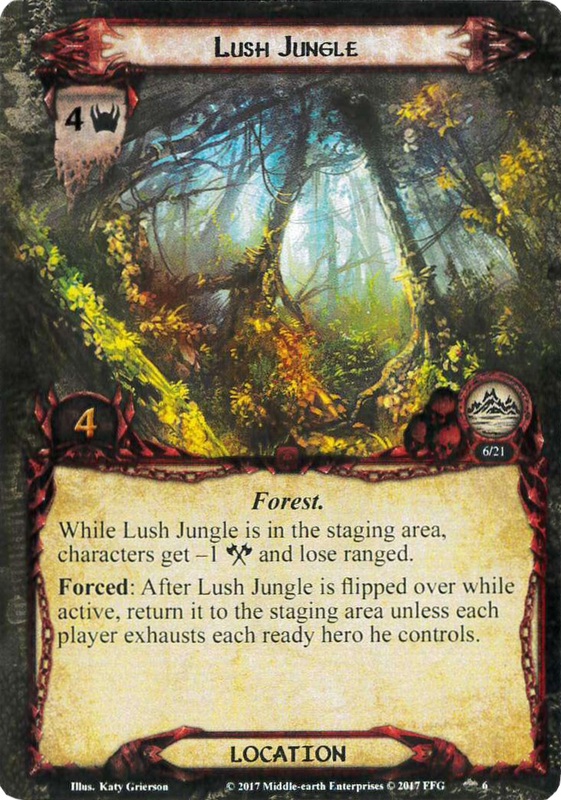 Forced: After Lush Jungle is flipped over while active, return it to the staging area unless each player exhausts each ready hero he controls. Uncharted. Cannot have player card attachments. 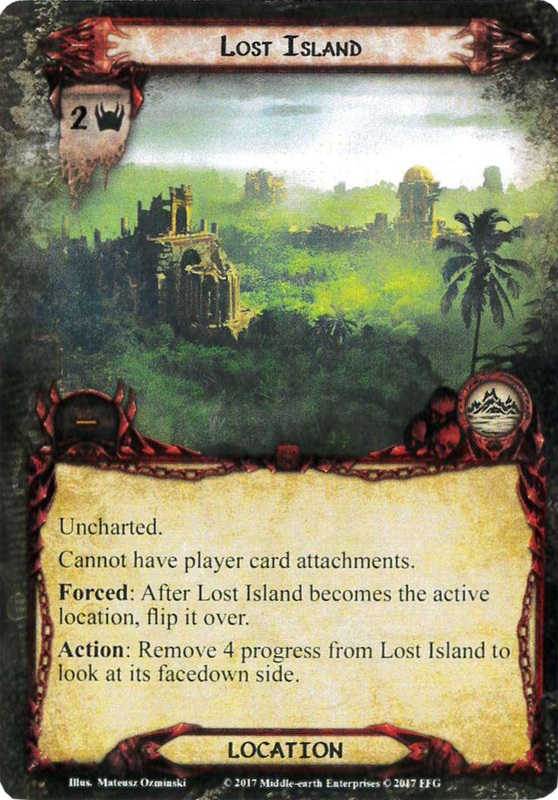 Forced: After Lost Island becomes the active location, flip it over. Action: Remove 4 progress from Lost Island to look at its facedown side. X is the stage number of the main quest. Travel: Each player spends 1 resource to travel here. Shadow: If the defending character is an objective-hero, ready it and cancel all damage from this attack. Response: After the players travel to Village Hut, the first player discards the top card of his deck. If that card is an ally, he puts it into play under his control, exhausted. Travel: Discard the top card of the encounter deck. If that card is an enemy, add it to the staging area. While Jungle Trail is the active location, each location in the staging area gets -1 Threat. 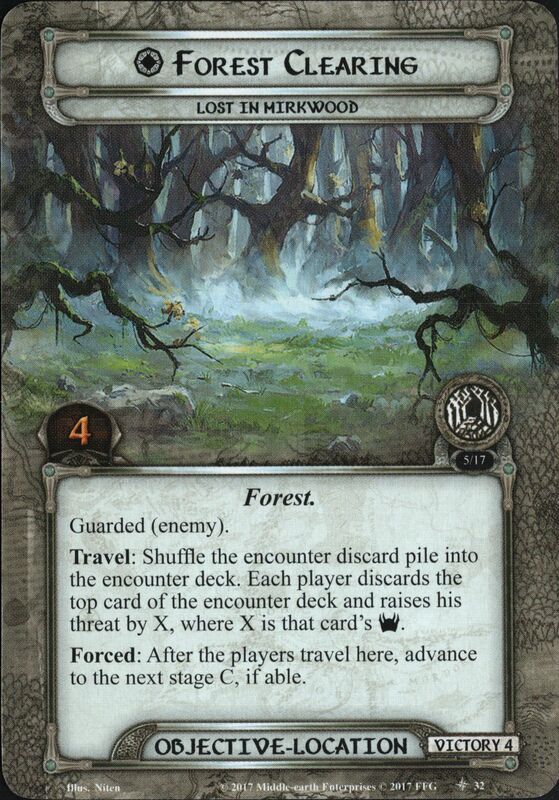 Travel: Reveal the top card of the encounter deck to travel here. While Mumak Trail is the active location, it gains: "Response: When Mumak Trail leaves play as an explored location, search the encounter deck and discard pile for a Wild Mumak and add it to the staging area. Shuffle the encounter deck." Travel: Raise each player's threat by 1 to travel here. Forced: After a character takes damage from an attack made by a Creature enemy, remove 1 progress from the current quest.Riddle: The first player names a sphere, shuffles his deck, and discards the top card. For each of those cards that matches, place 1 progress token on stage 2. While Troll Camp is in the staging area, Troll enemies get +1 Threat for each player in the game. While Troll Camp is in play, Bilbo Baggins gains: "Action: Exhaust Bilbo Baggins and spend 1 Baggins resource to remove 1 Sack card from a character. Bilbo Baggins may trigger this effect even with a Sack card attached to him." While Woody End is the active location, reduce each Hide X value by 1. When Revealed: Immediately travel to Stock-brook. If another location is currently active, return it to the staging area. While Green Hill Country is the active location, characters get +1 Willpower while committed to Hide tests. While Chetwood is in the staging area, Spy enemies get +1 Threat and +1 Attack. Shadow: Defending player discards 1 random card from his hand. Response: After the players travel here, place 1 non-unique enemy in play facedown under this location. While an enemy is under this location, it is out of play. Forced: After this location leaves play, return each enemy under it to the staging area face-up. While The Troll's Camp is the active location, each hero gets +1 Willpower, +1 Attack and +1 Defense. While Ettenmoors is the active location, do not deal Nazgûl enemies a shadow card during the combat phase. 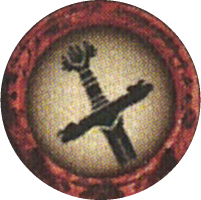 Forced: After any amount of progress is placed on Ettenmoors, reduce the Ring-bearer's life by 1. Pathless Country gets +4 quest points while in the staging area. Shadow: After this attack, the attacking enemy engages the next player then makes an immediate attack. While Wooded Shoreline is in the staging area, it gains archery 2. Travel: Search the encounter deck and discard pile for an enemy and add it to the staging area to travel here. Shuffle the encounter deck. Travel: A player at this staging area must engage an enemy in any staging area to travel here. Shadow: Attacking enemy gets +1 Attack (+2 Attack instead if the defending character has fewer printed hit points than the attacking enemy). While Ithilien Woods is the active location, it gains: "Forced: After a player engages a Harad enemy, he readies a character he controls." Travel: The first player reveals an encounter card to travel here. While Hills of Ithilien is the active location, it gains: "Forced: After a player engages a Harad enemy, deal 1 damage to that enemy." Shadow: Discard a non-objective attachment you control. X is the number of locations in the staging area. Travel: Each player must discard 1 random card from his hand to travel here. Response: After you travel to Forest Gate, the first player draws 2 cards. 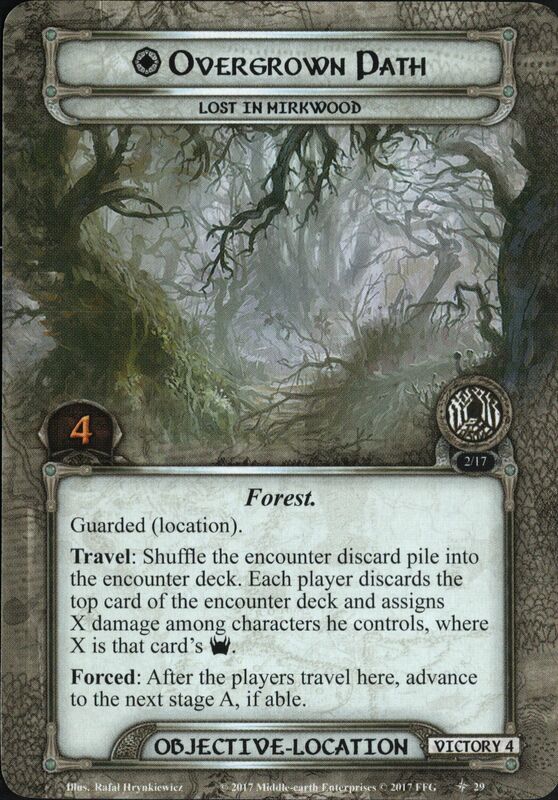 Travel: Reveal the top card of the encounter deck to travel here. 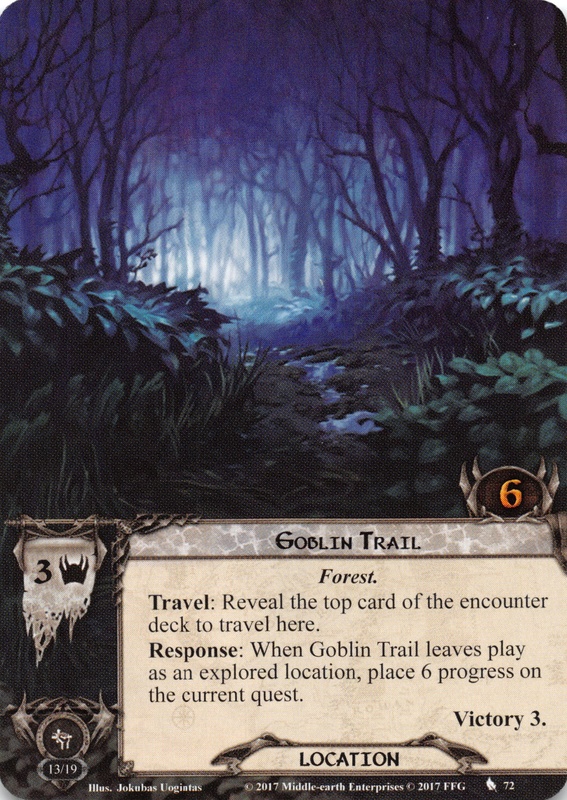 Response: When Goblin Trail leaves play as an explored location, place 6 progress on the current quest. Immune to player card effects. The player cannot win the game while Withywindle is in play. 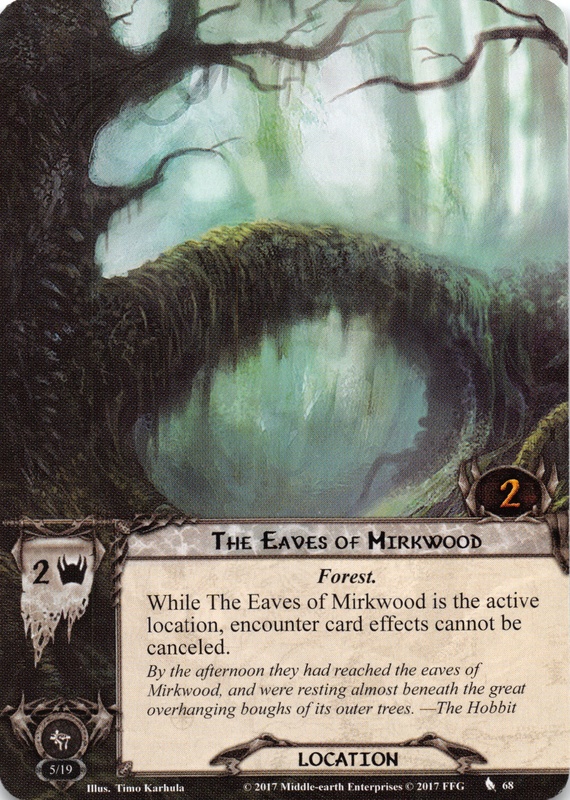 While Withywindle is the active location, the first player reveals 1 additional encounter card during the quest phase. When faced with the option to travel, the players must travel to Misleading Path if there is no active location. Shadow: Defending player discards each ally card in his hand. While Deep Gulley is in the staging area, it gains : "Forced: After a player optionally engages an enemy, that player raises his threat by X, where X is the engaged enemy's Attack." While Strange Woods is in the staging area, characters cannot be healed. Shadow: Attacking enemy gets +1 Attack. If this attack destroys a character, raise each player's threat by 2. X equals the number of players in the game. While Wall of Trees is in the staging area, progress must be placed on Wall of Trees before it can be placed on the current quest. 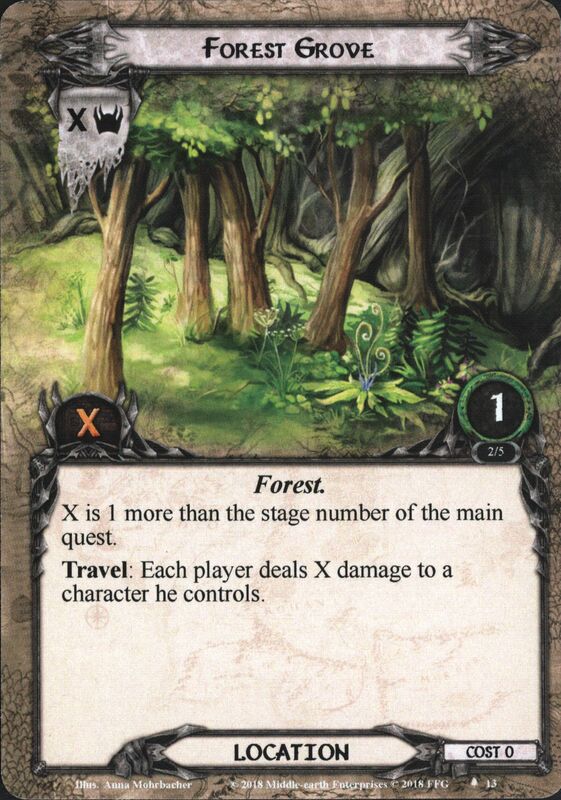 While Oppressive Forest is in the staging area, each player cannot play more than 1 card each round. Shadow: If there are no locations in the staging area, add this location to the staging area. Forest Battleground gets +1 Threat for each ally controlled by the player with the most allies. 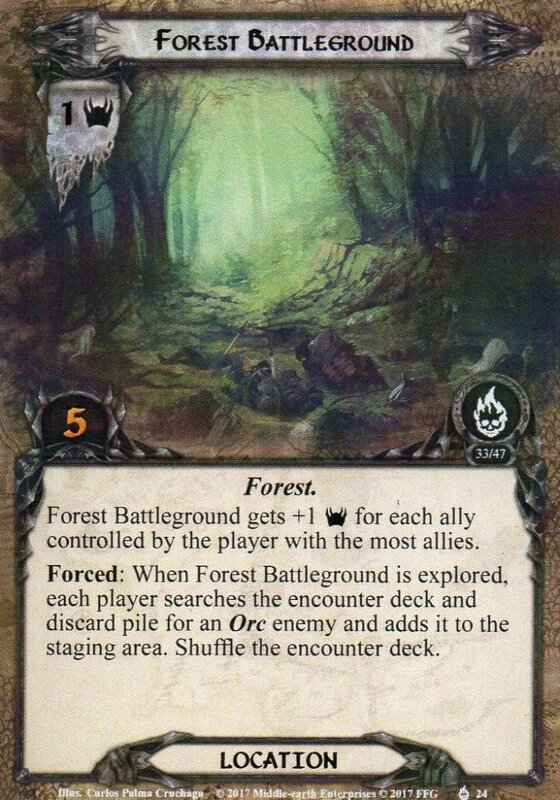 Forced: When Forest Battleground is explored, each player searches the encounter deck and discard pile for an Orc enemy and adds it to the staging area. Shuffle the encounter deck. 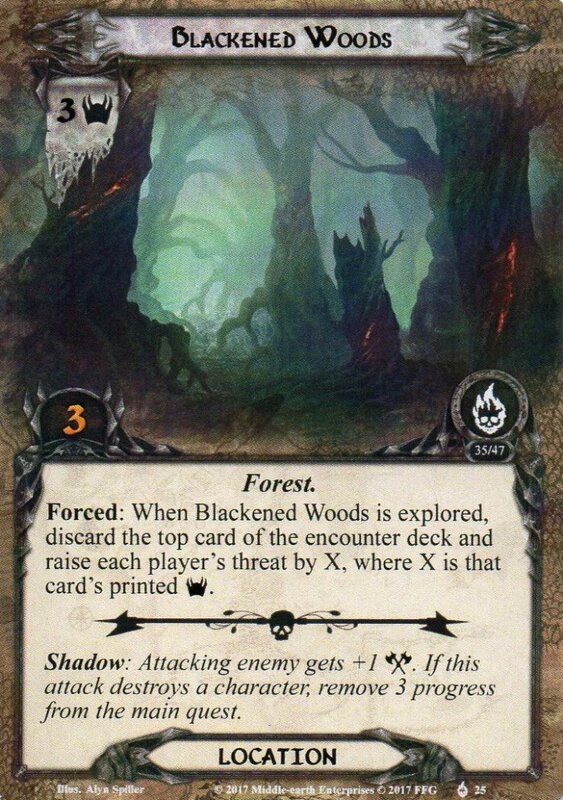 Forced: When Blackened Woods is explored, discard the top card of the encounter deck and raise each player's threat by X, where X is that card's printed Threat. Shadow: Attacking enemy gets +1 Attack. If this attack destroys a character, remove 3 progress from the main quest. Immune to player card effects. Response: After the players travel to Rhosgobel, add 1 resource to each hero's pool and each player draws 1 card. While Oak-wood Grove is in the staging area, progress cannot be placed on other locations in the staging area. Travel: Each player exhausts a character. Cannot have attachments. Twilight Hall gets +1 Threat for each character controlled by the first player. 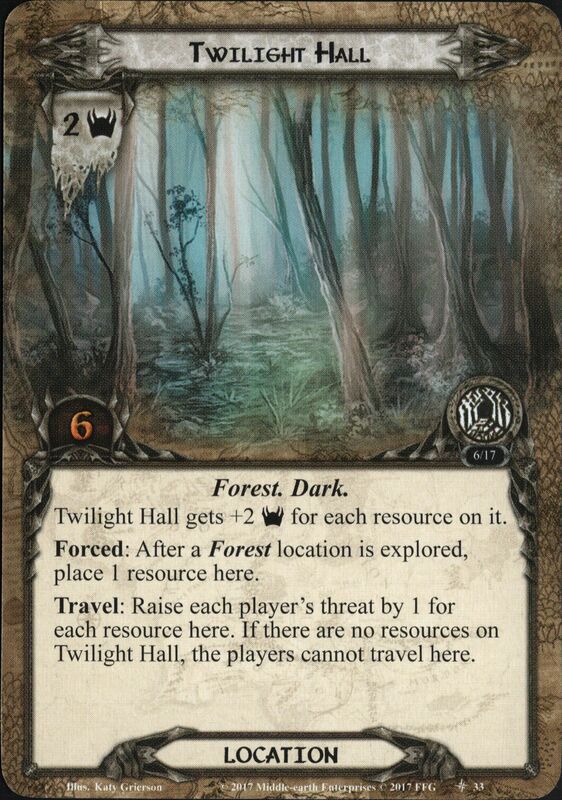 Forced: When Twilight Hall is explored, reveal 1 encounter card per player. When Revealed: Each Pine Slopes +2 Threat until the end of the phase. Travel: Raise your threat by 1 for each Pine Slopes in the staging area. Forced: When Watched Path is explored, discard the top card of the encounter deck. If the discarded card is an enemy, add it to the staging area. Forced: At the beginning of the staging step, discard Patch of Midnight and reveal the top card of the encounter deck. Shadow: If this attack destroys a character, reveal the top card of the encounter deck. Response: After the players travel to Troll Cave, each player draws 1 card. Travel: The opposing team searches the top 5 cards of the encounter deck for a Hill Troll and adds it to the staging area, if able. Shuffle the encounter deck. While Hunter's Lookout is in the staging area, it gains: "Forced: At the end of the round, raise each player's threat by 1 for each enemy in the staging area." Travel: The highest Attack enemy in the staging area makes an immediate attack against the first player. While The Shadow Road is in the staging area, it gains: "Forced: After a player optionally engages an enemy, he deals 1 damage to a character he controls." Travel: Each player deals 1 damage to a character he controls. Forest Gate gets +1 Threat for each enemy in the staging area. Shadow: Attacking enemy gets +1 Attack for each enemy engaged with you. While Pitch-dark Thicket is in the staging area, enemies in the staging area cannot take damage. Shadow: If attacking enemy was engaged this round, it cannot take damage until the end of the round. While Forest Stream is in the staging area, it gains: "Forced: At the end of the round, remove 2 progress from the main quest." Travel: Raise each player's threat by 2. 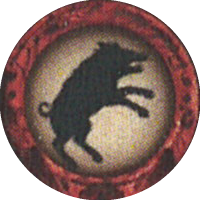 While The Wargs' Glade is in the staging area, the first Warg enemy revealed each round gains surge. 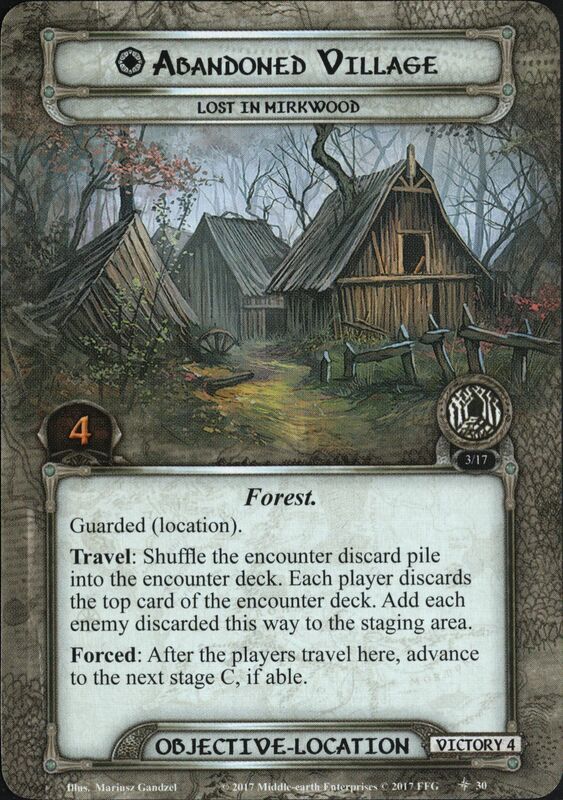 Forced: When The Wargs' Glade is explored, the opposing team searches the encounter deck and discard pile for a non-unique Warg enemy and adds it to the staging area. Shuffle the encounter deck. Immune to player card effects. Travel: The opposing team searches the encounter deck and discard pile for a 0 cost enemy and adds it to the staging area, if able (1 cost or less if there are two or more players). Shuffle the encounter deck. X is 1 more than the stage number of the main quest. Travel: Each player deals X damage to a character he controls. 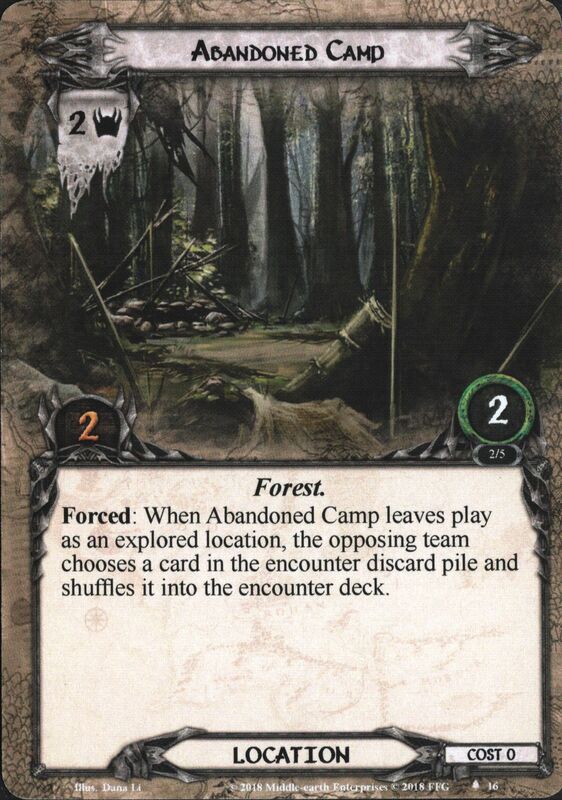 Forced: When Abandoned Camp leaves play as an explored location, the opposing team chooses a card in the encounter discard pile and shuffles it into the encounter deck. While The Spiders' Ring is in the staging area, each Spider enemy gets +1 Threat. 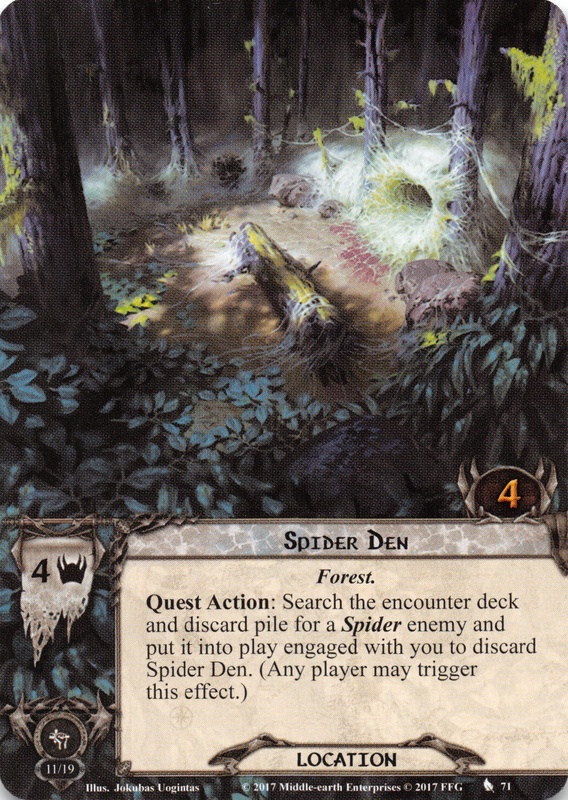 Forced: When The Spiders' Ring is explored, the opposing team searches the encounter deck and discard pile for a non-unique Spider enemy and adds it to the staging area. 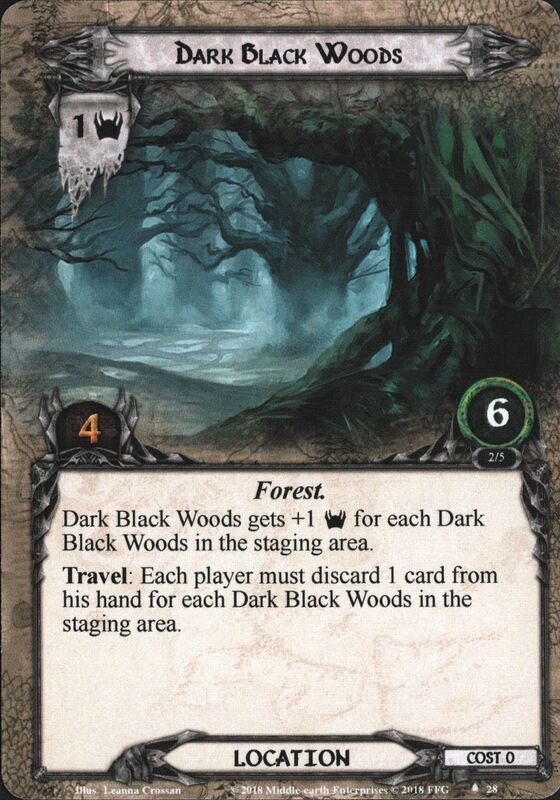 Dark Black Woods gets +1 Threat for each Dark Black Woods in the staging area. 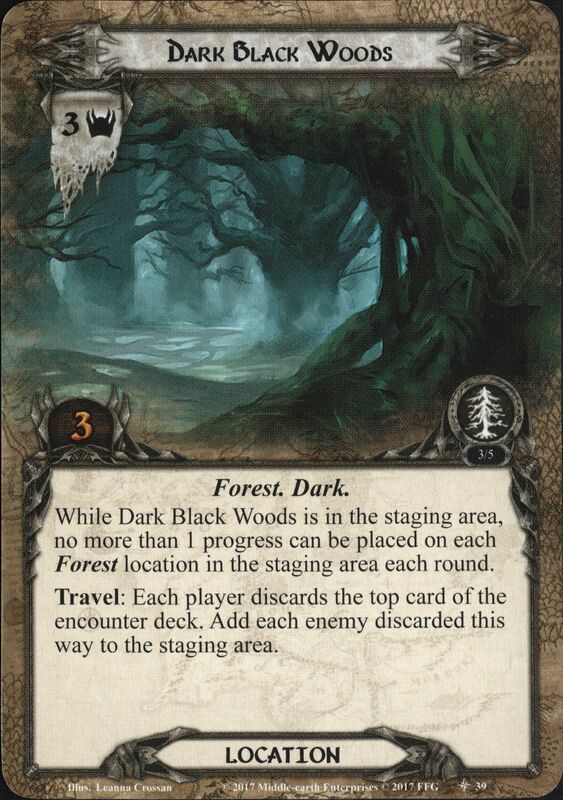 Travel: Each player must discard 1 card from his hand for each Dark Black Woods in the staging area. 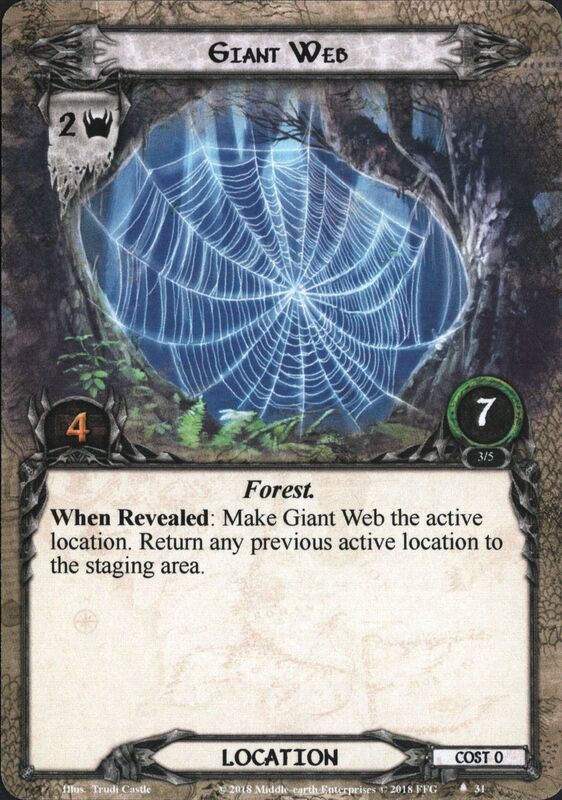 When Revealed: Make Giant Web the active location. Return any previous location to the staging area. When Revealed: Until the end of the phase, each location in the staging area gets +1 Threat. Shadow: Each enemy engaged with you gets +1 Attack until the end of the phase. While The Eaves of Mirkwood is in the staging area, no more than 1 progress can be placed on each location in the staging area each round. Travel: Each player discards 1 random card from his hand. While Dry Watercourse in in the staging area, each player cannot reduce his threat by more than 1 each round. Travel: Raise each player's threat by 1. 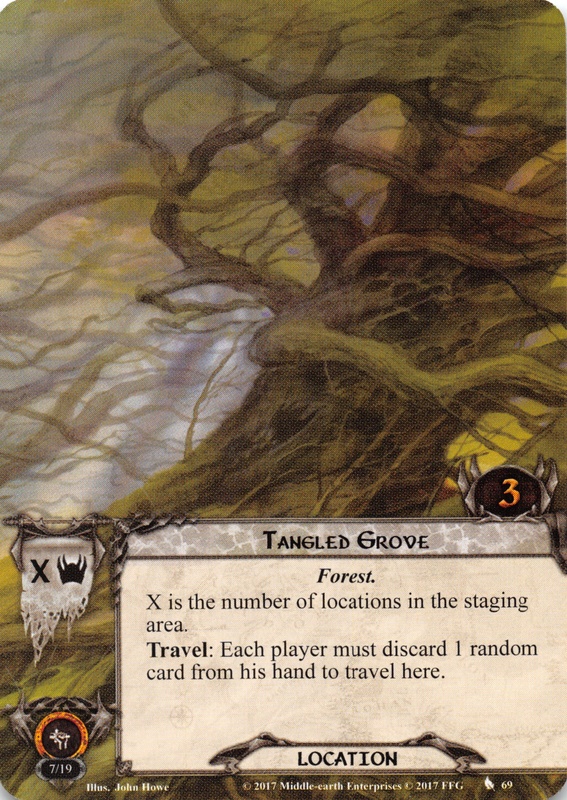 While Dark-wood Grove is in the staging area, it gains: "Forced: After a 'when revealed' effect is canceled, raise each player's threat by 3." Travel: Reveal the top card of the encounter deck. 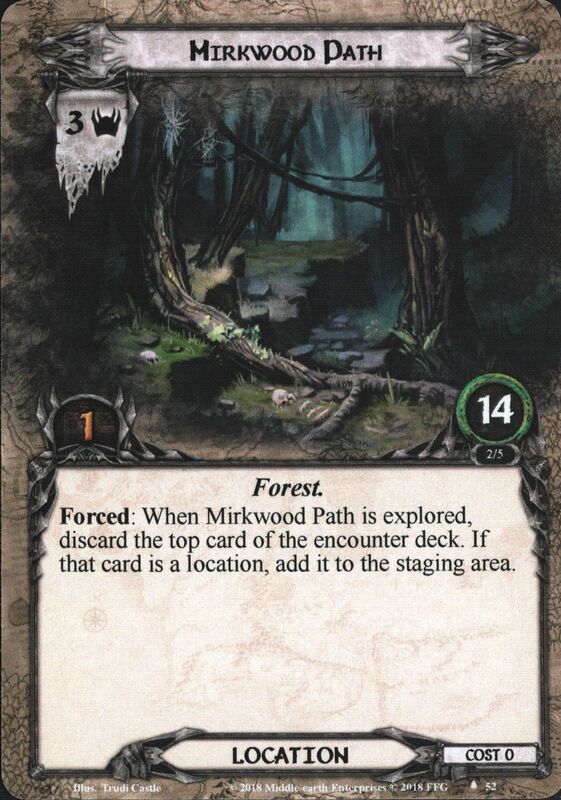 Forced: When Mirkwood Path is explored, discard the top card of the encounter deck. If that card is a location, add it to the staging area. Each player who does not control at least 1 Clue card cannot draw cards through card effects. Shadow: If you do not control at least 1 Clue card, discard all cards from your hand. While Troll Lair is in the staging area, players cannot reduce their threat. Shadow: If attacking enemy is a Troll, remove 4 damage tokens from it. 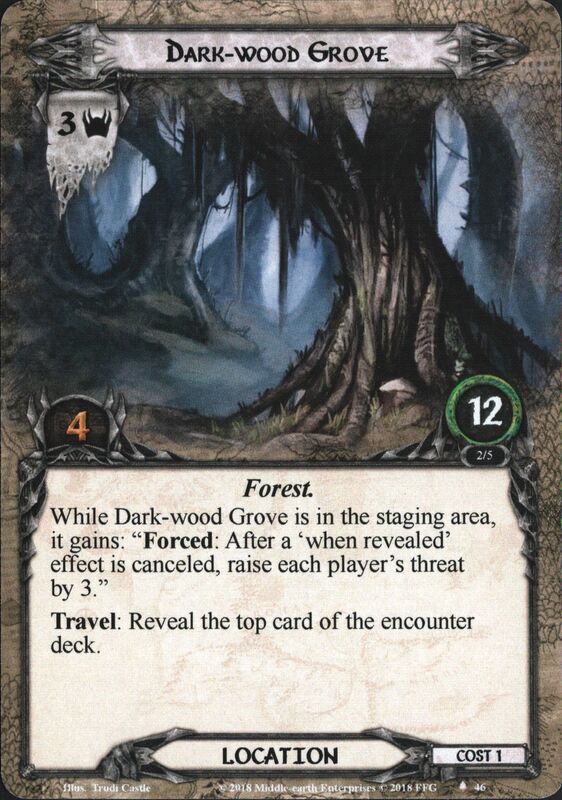 Dark-wood Grove gets +1 Threat and +1 quest point for each Athelas card in play. Shadow: If defending player controls at least 1 Athelas card, attacking enemy makes an additional attack after this one. While Labyrinthine Woods is in the staging area, Creature enemies get +1 Threat and +1 Attack. Shadow: After this attack, attacking enemy engages the next player and makes an immediate attack. While Pitch-dark Thicket is the active location, all characters lose the ranged keyword. Shadow: Attacking enemy cannot be attacked by characters with the ranged keyword until the end of the phase. Progress cannot be placed on Deceptive Path while it is in the staging area. Forced: After Deceptive Path becomes the active location, shuffle the encounter discard pile into the encounter deck and discard cards from the top of the encounter deck until a location is discarded. Reveal that location and make it the active location. Then, discard Deceptive Path. When Revealed: Reveal the topmost Spider enemy in the encounter discard pile and add it to the staging area. Shadow: The player guarding Gollum must discard all resources from each of his heroes' resource pools. While Concealed Woods is the active location, the first enemy with the ambush keyword revealed from the encounter deck each round gains surge. Shadow: Attacking enemy gets +2 Attack if engaged with the first player. When assigning archery damage to a character, you must continue assigning archery damage to that character until that character is destroyed or there is no more archery damage to assign. 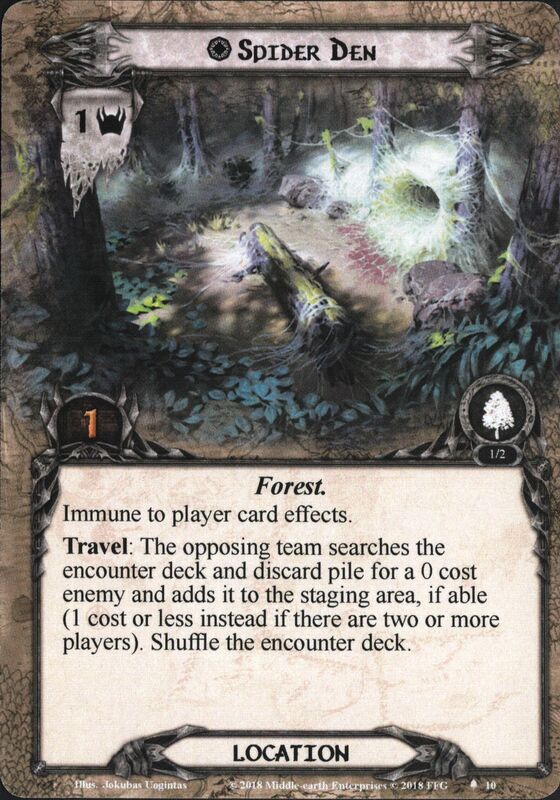 While Dense Thickets is in the staging area, each Forest location in play gets +1 Threat. Shadow: Excess damage dealt by this attack (damage that is dealt beyond the remaining hit points of the character damaged by this attack) must be assigned to a Ranger objective in play. Immune to player card effects. While Devil's Mirk is in the staging area, characters cannot be healed. While Devil's Mirk is the active location, each Wose enemy gets +2 Defense. Players cannot travel to Eilenach unless there is at least 1 resource in each hero's resource pool. Shadow: If the defending character has no resources, deal it 1 damage. While Stonewain Valley is in the staging area, resources discarded or spent by the first player for any reason are placed on Stonewain Valley. Stonewain Valley gets +1 Threat for each resource on it. X is the highest number of hidden cards in any player's play area. Shadow: Turn 1 hidden card in your play area faceup. If it is a treachery card, attacking enemy makes an additional attack after this one. While Tangled Forest is in the staging area, it gains: "Forced: After any amount of progress is removed from the current quest, assign X damage amoung characters in play. X is the number of progress just removed. This ability does not stack with other copies of Tangled Forest." While Entwood is in the staging area, each Huorn enemy in the staging area gains: "Immune to player card effects." Travel: The first player engages the highest engagement cost Huorn enemy in the staging area. While Dark Corner of Fangorn is in the staging area, each Huorn enemy loses the hunder keyword. Forced: After Dark Corner of Fangorn becomes the active location, each engaged Huorn enemy makes an immediate attack. While Hithaeglir Woods is in the staging area, each Dunland enemy in the staging area cannot take damage. Travel: Deal each Dunland enemy a shadow card to travel here. While Sacred Forest is in the staging area, each Guardian enemy gains: "Forced: After any number of time counters are removed from this enemy, heal 2 damage on it for each time counter removed." Travel: Remove each time counter from an enemy in play to travel here. When faced with the option to travel, players must travel to Haunted Pillars, if able. When Revealed: Either return the active location to the staging area, or Haunted Pillars gains surge. Shadow: Attacking enemy gets +3 Defense until the end of the phase. 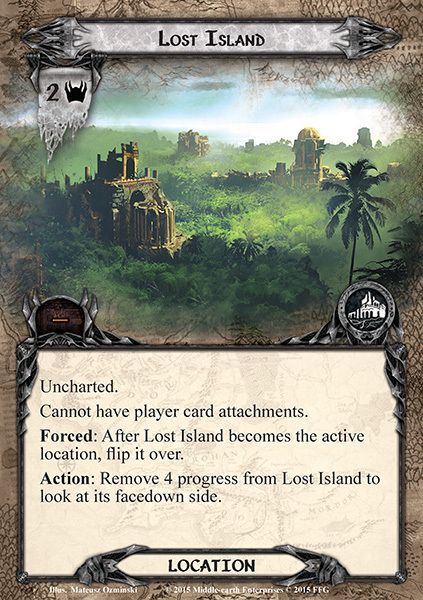 Forced: After progress is placed on Northern Chetwood (and it is still in play), search the encounter deck, discard pile and victory display for Lost in the Wilderness, and reveal it. Shadow: Discard 1 card at random from your hand for each point of damage deal by this attack. While Overgrown Steps is in the staging area, it gains: "Each Uncharted location in the staging area gets +1 Threat." Travel: Raise each player's threat by 2 to travel here. Forced: Each time a Baggins resource is spent or discarded, raise each player's threat by 1. Shadow: Deal attacking enemy 2 additional shadow cards for this attack. While Dark Colony is the active location, poisoned characters cannot ready. Travel: A player at this stage must give 1 poison to a hero he controls to travel here. X is the number of poison in play. Forced: When this location is explored, make 1 hero unconscious. Shadow: Attacking enemy gets +1 Attack for each poisoned character you control. While Patch of Midnight is the active location, treat the text box of each poisoned character as if it were blank (except for Traits). Shadow: Raise your threat by 1 for each poisoned character you control. While Green-Hill Country is in the staging area, add 1 to each Hide X value. Travel: The first player makes a Hide 1 test. Shadow: After this attack, attacking enemy engages the next player then makes an immediate attack. While Stock Woods is in the staging area, players cannot commit more than 2 characters to a Hide test. Travel: The first player makes a Hide 1 test. Shadow: Attacking enemy gets +2 Attack (+3 Attack instead if you have failed a Hide test this round). 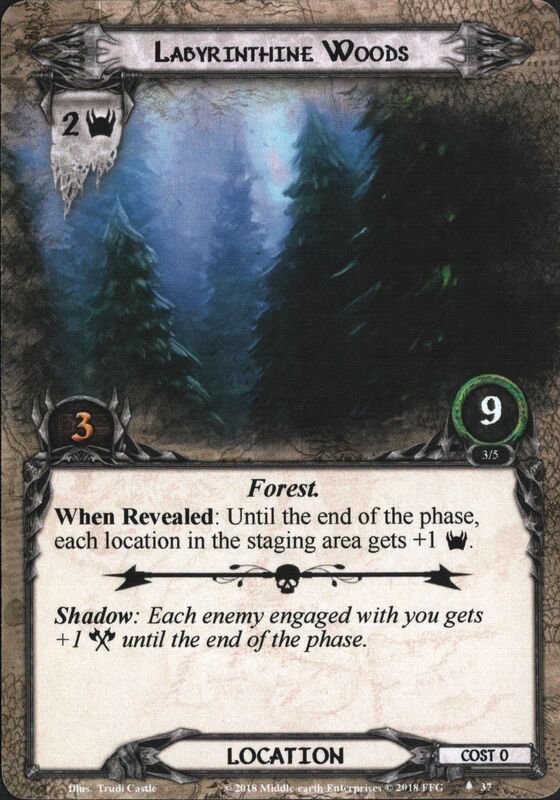 While Trollshaw Forest is in the staging area, it gains: "Forced: After a 'when revealed' effect is canceled, reduce the Ring-bearer's life by 1." Travel: Reduce the Ring-bearer's life by 1 to travel here. Pathless Wilderness enters play with 3 resource tokens on it. Forced: At the end of the round, discard 1 resource token here. Then, if there are no resource tokens here, reduce the Ring-bearer's life by 3. Forced: When Ettendales is explored, shuffle the top card of the burden deck into the encounter deck. Shadow: Attacking enemy gets +2 Attack. If this attack destroys a character, reduce the Ring-bearer's life by 1. While Langflood River is in the staging area, no more than 4 progress can be placed on this quest stage each round. Forced: When Langflood River leaves play as an explored location, add it to the staging area to the left, if able. While Western Emyn Muil is in the staging area, each Uruk-hai enemy at this stage gains Toughness 1. Travel: A player at this stage must engage the highest toughness enemy in the staging area to travel here. While Wooded Glade is the active location, treat each non-objective attachment's text box as if it were blank. While Dense Fern-brake is the active location, enemies in the staging area are immune to player card effects. 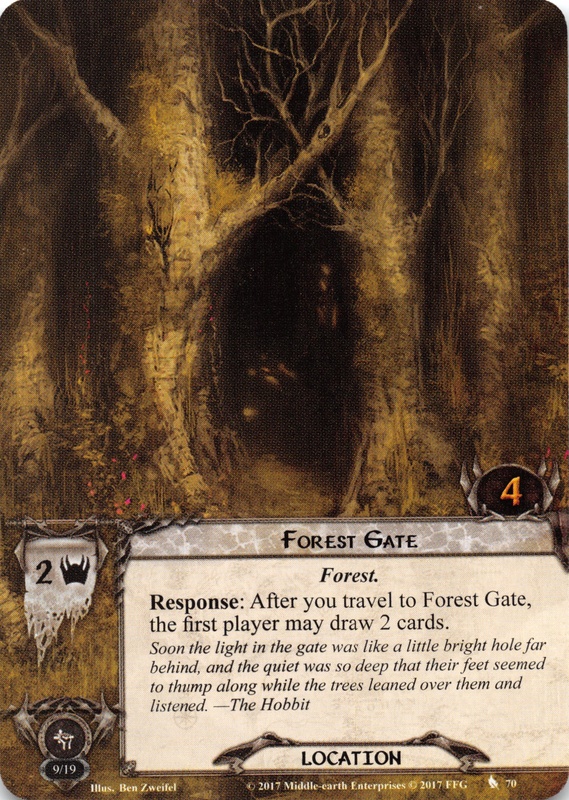 Shadowy Thicket gets +2 Threat for each facedown card under The Black Gate. Travel: The first player reveals the top facedown card under The Cross-roads and adds it to the staging area to travel here.